Desert Storm veteran Kathy Tilbury and Koa. 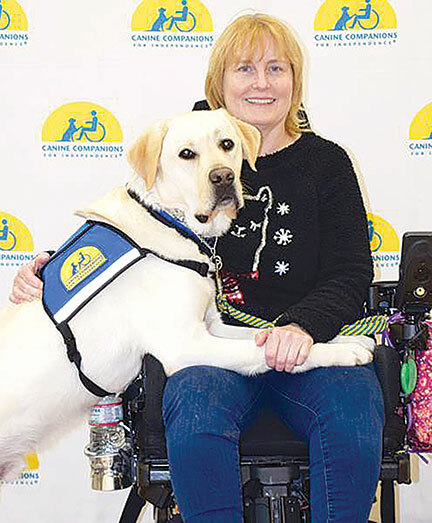 Chester resident Kathy Tilbury, U.S. Navy retired, recently received an assistance dog from Canine Companions for Independence. Tilbury was matched with Koa II, a 3-year-old lab/golden retriever cross who was trained to respond to over 40 commands. Koa can turn light switches on and off, open and close doors and retrieve dropped objects. However, one of his most important jobs will be to provide constant companionship. 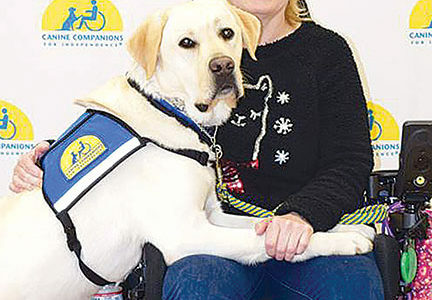 Tilbury and Koa recently returned to Chester after completing Canine Companions’ Team Training class, an intense, two-week course held at the organization’s Northeast Regional Center in Medford, N.Y., one of five such centers nationwide. Each student who attends Team Training – held at each center four times a year – is paired with a fully trained, working assistance dog like Koa, and is taught to work with that canine companion. The training course consists of daily lectures, exams, practice and public outings. Tilbury and Koa are settling into a routine back home in Chester. “Koa is a very special dog and I hope to have many wonderful years with him,” said Tilbury, who retired as a petty officer (E5). Canine Companions for Independence is the largest nonprofit provider of trained assistance dogs. Established in 1975, Canine Companions provides highly trained assistance dogs to children and adults with disabilities, and is recognized worldwide for the excellence of its dogs, and quality and longevity of the matches it makes between dogs and people. There is no charge for the dog, its training and on-going follow-up services.